Amsterdam can barely cope with the growing numbers of cyclists, as a survey of mobility in the Dutch capital over the past 25 years demonstrates. There are as yet no bicycle jams, but partly due to the arrival on the scene of carrier bicycles, the width of bike paths is increasingly a problem. And of course parking guarantees a headache. In busy squares, at train and metro stations, but also near university buildings, shopping centres and leisure spots in narrow Amsterdam streets an increasing amount of public space is taken up by parked bicycles, according to the report ‘Mobiliteit in en rond Amsterdam, Een blik op de toekomst vanuit een historisch perspectief’. Data demonstrate that at these locations often several dozen percent of all bicycles are parked outside the official parking spaces. In June of 2007 for instance 1,390 bicycles were parked at the back of Amstelstation, whereas capacity ran to no more than 1,100. This comes down to an occupancy rate of 126%. For the west side of Centraal Station (including the bicycle flat) this was a staggering 136% in October of 2008. The overall estimated number of bicycle parking spaces (stands, staples and parking facilities) is currently 200,000. The heaviest streams of cyclists are mainly headed for the central part of the town centre. But bicycle numbers in the immediate vicinity of the town centre and the surrounding ring are impressive as well. The large numbers of cyclists do not cause substantial delays due to traffic jams. But a number of busy routes does have a problem with the width of the bike paths, partly due to the increasing use of carrier bicycles. The busiest cycling routes are Marnixstraat (1,970 passing cyclists in the evening peak hour), Weteringschans (1,920) and Weesperzijde (1,900). Nevertheless the bicycle can easily compete with car and public transport in the inner city, according to local authorities. The percentage of car trips by Amsterdam residents has fallen in all distance categories. Bicycle use has greatly increased in all distance categories under 10 kilometres. This has happened, however, not only at the expense of the car, but also of public transport. Over short distances cycling is apparently more attractive than public transport. Bicycle ownership among Amsterdam residents has greatly increased over the past 25 years (63% versus 73%). Ownership in Amsterdam is below the overall Dutch average (73% versus 88% ). The increase in bicycle ownership was greatest among residents aged 45 and over, among people aged over 65 it has almost doubled (from 27% to 48%). The average number of bicycle trips per person per day is however higher in Amsterdam (0,9 versus 0,8). 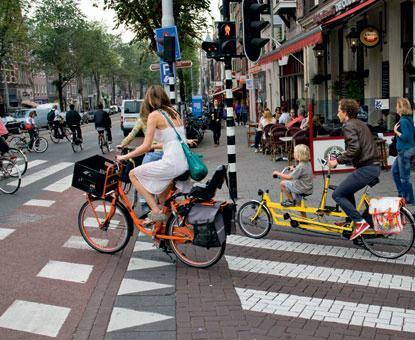 People there use their bicycles therefore more intensively than the average Dutchman. The largest increase in the number of bicycle trips per person per day occurs in the group aged 45 to 59. This may be due to car parking policies, but also to health advantages or a more positive attitude towards cycling in general, is the impression of the writers of the report. The group aged 12 to 15 also cycles more and is incidentally the group with the highest bicycle use. Among residents in higher income brackets the cycling percentage in the overall number of trips has more than doubled (from 15% to 33% ). In Amsterdam people park their bicycles at home in a storage facility (46%), in the street (36%), in their home (10%), in the courtyard (5%) or a parking facility (2%). In the districts outside the ring road the percentage of bicycles parked in a storage facility is considerably higher than in the neighbourhoods within the ring road. Within the ring road over more than half of all bicycles are parked in the street(53%), whereas this is rare outside the ring road(4%). OK, David, in the Alternative Universe the cycling mode share in the UK is the highest in Europe (after Andorra "Turons són excuses per no!") and they just invaded the Netherlands, victoriously. Your job as Minister for Cycling is to implement solutions for the problems or near-problems mentioned in this blog entry. Very interesting. But it was surprising to see the low cycle counts. Even the busies of main cycle roads have less than 2,000 cyclists per hour during peak hours. As a wild and crazy guess as to what is happening during peak hours (buttressed by my own observations) I'll say that Toronto's main cycle roads may have as much as 25% of the cycle volume as Amsterdam's main cycle roads. That's impressive. Next year we may be getting a major upgrade with a network of the downtown cycle lanes being upgraded to Dutch-style separated lanes with intersection protections. The fact that we can get 25% of Amsterdam levels with significantly crappier levels of infrastructure is amazing. But what are they going to do about path width and parking spaces? I've already heard complaints that the bakfiets is the SUV of bicycles. This issue is going to come to a head at some point. Too many bicycles is an issue we can only dream about here in Australia. As I parked my bike at the train station this morning I was one of only 3. This is with secure lockup facilities and on a perfect blue sky day in the high 20's. P.S Don't tell our politicians that bike parking can become an issue, they may try everything in their power to put people off mass cycling and promote car driving instead - Oh, wait, they are already doing that! Kevin: I'm happy to hear that there are a decent number of cyclists in Toronto. However, you're not comparing like with like. 2000 cyclists per hour in a city of 770000 people vs. 4000 over a 12 hour period in a city of 2.5 M people. You've got to be careful with these raw measurements. These days, London claims 500000 cycle journeys per day, while Groningen can only claim about 300000. However, London's population is 8M and Groningen's is just 190000. While the raw figure appears to imply that London is a bigger cycling city than Groningen, adjusted for population, the modal share is actually 25 times smaller. BTW, the "0.9 bicycle journeys per day" figure for Amsterdam means that Amsterdam residents between them make 690000 bicycle journeys per day, which is somewhat higher than London even though the population is under a tenth of the size. J: the parking problem is being solved by creating more "bike boxes" on the pavement, large painted rectangles for people to park their bikes in. Cheaper than building bike stands, and many Dutch people don't bother with bike stands even when they're available. I find the cargo bike problem to be way exaggerated. I've seen stickers you can apply to other people's cargo bikes that say "this bike is too big, and I bet you can't control it properly either" which seems like an extraordinary length to go to about a minor inconvenience. Do you really want those cargo bike users to switch to cars? They're part of the solution, not part of the problem. Kevin: Bear in mind that in Amsterdam it's busy throughout the day, whereas the Toronto figures show an enormous spike in the morning and evening peak. Also, there are relatively few jobs in Amsterdam's city centre (the centre is largely retail and night life) so many offices and business parks generate bike traffic elsewhere in the city. Yes, I am quite aware that I am not comparing like with like. That is why I use phrases like "wild and crazy guess" for the peak hours part of the 12 hours count. However, since I observe this first-hand, the guess isn't perhaps so wild after all. Toronto's busiest streets having even 25% of Amsterdam's cycle traffic is like the joke about the dog walking on its hind legs. Its not that the dog can do it well, but that the dog can do it at all. I can attest that the "bicycle traffic jam" is a big problem in Toronto. Here, what happens is that a bunch of bikes will pile up in the bike lane at a red traffic light. Then when the light turns green, faster cyclists at the back of the pack are stuck - there is no effective way of passing slower cyclists in front. @Kevin - A major difference (aside from the total population point already raised) between Toronto and Amsterdam is that Amsterdam has cycle paths on *every* street. So all bicycle traffic does not congregate on the "busiest" routes in the same way it will have a tendency to in a city with only a few bicycle routes. @Allison: Are you saying that all streets in Amsterdam are fit for cycling? As I understand it mostly only faster 50km/h streets have cycle paths. All streets that have a slower than 50 km/h speed limit are basically bikes first, cars take second place. And for most motorways, which do not allow cars, there are bike routes that do not allow cars. I am not sure of the numbers but I think they equal out. Sorry, that should have read: "And for most motorways, which do not allow bikes, there are bike routes that do not allow cars." Non-dutch speakers will have to use google translate, but there are a number of anti-bakfiets comments in there. DrMekon: I wouldn't take the comments on fok.nl terribly seriously. It's mostly rather juvenile. The first "anti-bakfiets comment" is by someone who says they're ugly. If you click on his name, and look at past comments you'll see that previously he wishes death upon all who work for T-Mobile. That's about the level of discourse you can expect.